Welcome to the Ink It! Stamp It! 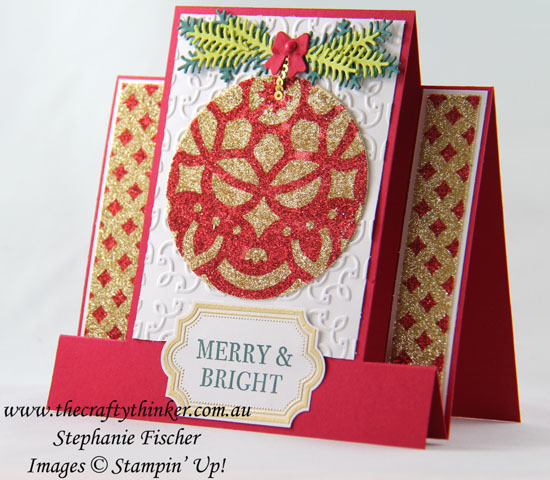 Design Team Blog Hop - we hop every month so be sure to pop back and visit us again! Today our theme is Technique. 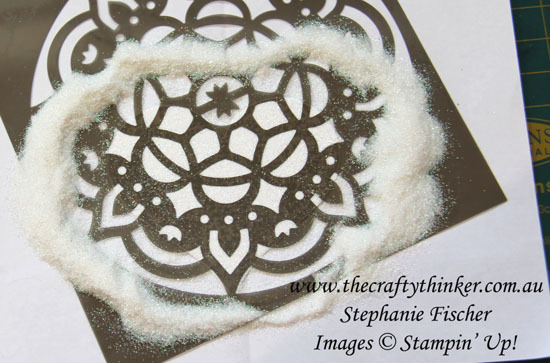 You are currently at my page - Stephanie Fischer, The Crafty Thinker. At the end of my post there is a full line of team members. This is a long post due to all the instructions, so do please scroll down to the bottom and click on the name after mine in the list to continue the hop. 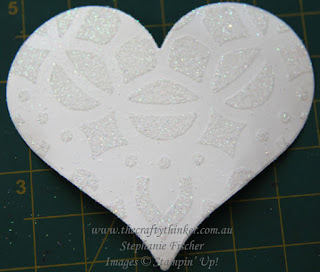 If there's an actual name for this technique, I don't know what it is but I call it the Glitter Stencilling Technique. Warning: If you can't cope with unconstrained mess - this technique is probably not for you! 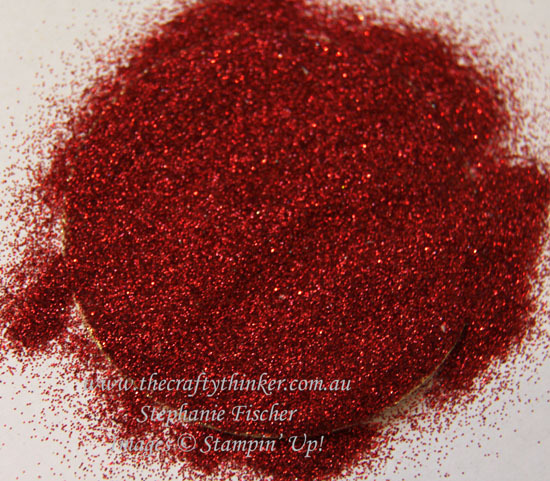 No matter how hard I try to keep things clean and controlled; no matter how quickly I use the vacuum cleaner or step on old towels in the door of my craft room - the glitter spreads and pretty soon I'm finding it all over the house! Step 1: Apply Multipurpose Adhesive Sheet to one side of your chosen cardstock (I've used Whisper White). Step 4: Apply a thin layer of soap to the back of your chosen stencil. This will prevent the stencil from sticking too firmly to the adhesive. Tip: Time and care taken on this step will pay dividends! I like to moisten a small bar of soap with my fingers until it produces a creamy lather and then carefully spread it onto the mask with my fingers. If necessary, I remove any soap that finds its way to the front of the mask. Step 5: Lay the mask, soap side down, onto the sticky shape. Step 6: Tip some glitter on top - be generous. 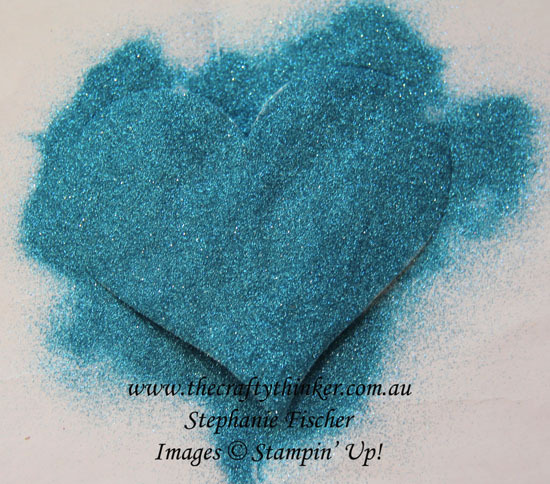 Tip: Use very fine glitter (the finer the glitter, the more consistent the coverage). You'll need two colours of glitter. 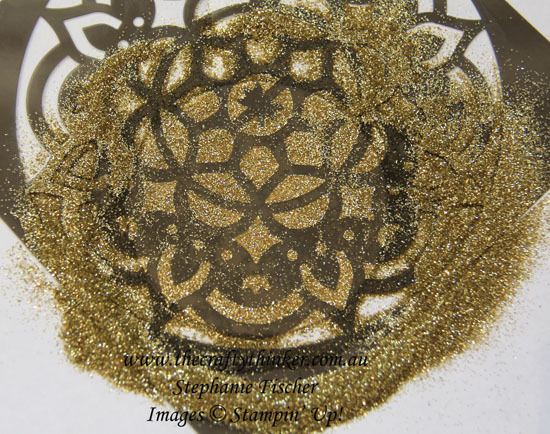 Step 7: Use clean, dry fingers to press the glitter down through the mask. Use small circular motions to ensure complete coverage over the project. Tip: Take your time to "burnish" the glitter well. 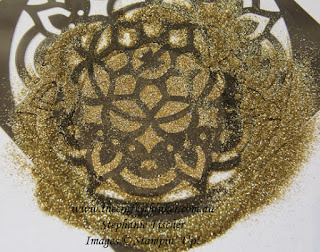 Step 8: Tap off all the excess glitter and put it away then carefully remove the mask/stencil. Tip: I like to work in gently from the edges. Avoid touching the adhesive. 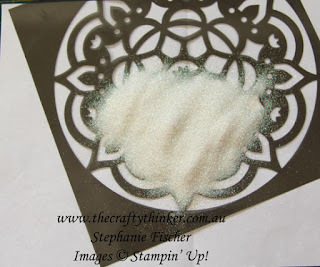 Step 9: Place the project on a clean piece of scrap paper to catch the glitter and then pour the second colour of glitter on top of the project. Tip: You will probably be a little nervous the first time you do this but don't worry - the second glitter will stick to the newly revealed adhesive. Step 10: Press and "burnish" (use those small circular movements) the glitter onto the project. Step 11: Tap off the excess glitter and put it away for next time. Step 12: Burnish or polish the project a little more with your finger to ensure that all the glitter is well adhered and enhance the shine. 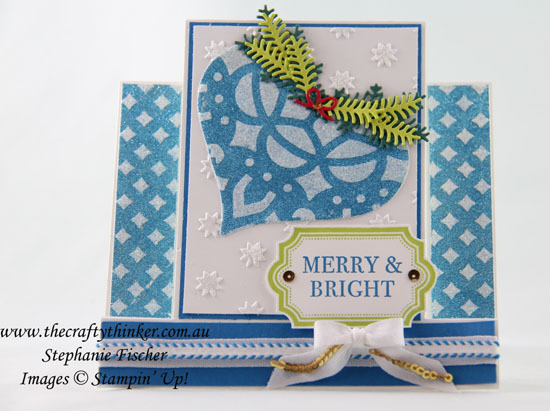 For the card below, I repeated the process with the same colours and a different mask to produce the patterned side strips. 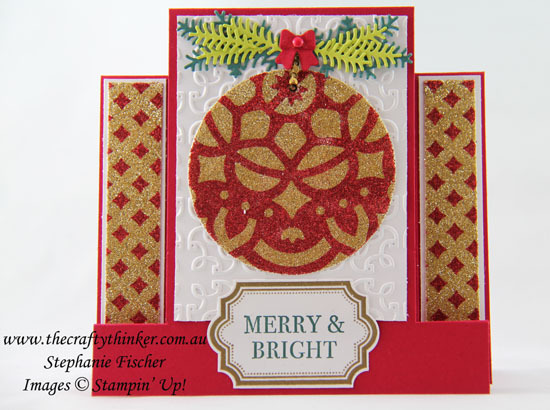 Here's the card I made with the red and gold circle. Same method with different colours. 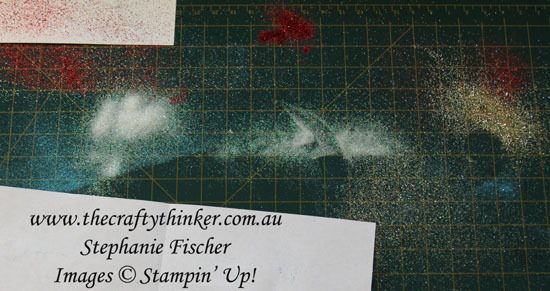 There's always some glitter on my desk afterwards - but I seem to have been extra messy this time! The aftermath! Not a technique for anyone unwilling to find a bit glitter all over the house. 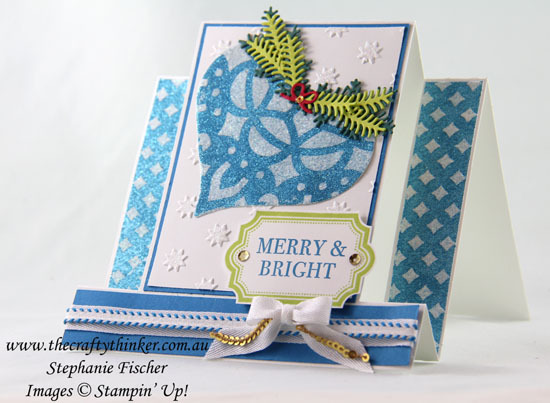 Both cards were finished with pine pieces cut in Tranquil Tide and Lemon Lime Twist using Christmas Staircase dies. The labels are made with the Labels To Love and Hearts Come Home stamp sets. They're cut with the Everyday Label Punch. Thank you so much for joining us today. We hope you'll join us again next month for our Christmas projects! I'm Stephanie Fischer and to keep hopping around see the list below to see who is up next with another great project .